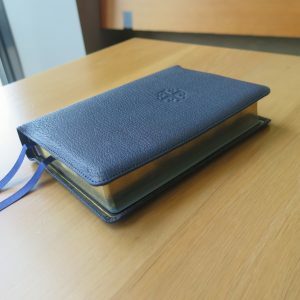 I pre-ordered this PSQ as a gift for one of my sons who sometimes travels on business and whose favorite translation is the NASB. After receiving it, I know I’m going to have to have the NKJV when it is published! My only doubt was concerning the 8.5 pt. size print, which usually my older eyes do not like. I was very pleasantly surprised that I can read this print even under good artificial light. For long, extended reading, I know I’ll still prefer larger print (the regular Q has 11 pt. print), but the font that Schuyler chose is dark and very readable. Not all 8.5 pt. type is the same! As with the regular size Q, the deep red chapter numbers add just the right accent to this premium edition. As for its other characteristics, it’s just as wonderful as I was expecting. 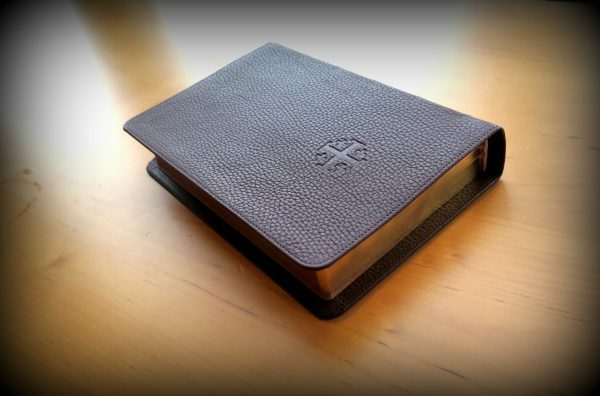 The supple brown calfskin cover has a soft, pebbly grain, and the Bible lies flat when opened at any page. The compact size lends itself to being easily held in one hand despite the very flexible cover. There are two narrow gold satin ribbons. The art gilting is Schuyler’s usual lovely coppery color. The paper is excellent as expected. There are nice maps but no concordance (the print would have been far too small). I didn’t want and would not use the blank lined pages in the back, but I’m happy to note that they add almost no extra thickness, which would have been a big negative imo. 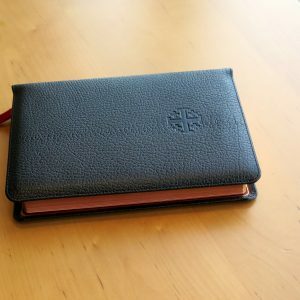 The compact size is a huge positive (quality compact Bibles are few and far between), and this is a superb little Bible in every way. 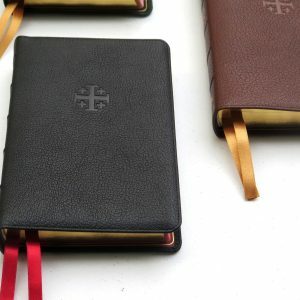 As long as you are okay with the 8.5 print size (which is really “regular size” print for many Bibles), you shouldn’t be disappointed in any way with this edition. Well done, as usual, Schuyler! Great, more portable alternative to the full-size Quintel. The text is crisp and readable, the font size is about the same as the Cambridge Clarion. The Quintel layout translates very well to the smaller format! Columns on the full-size Quintel are about 1.5 times as wide as those on this personal size, this edition is slightly taller but not as wide as the Clarion (and less awkward in my opinion). 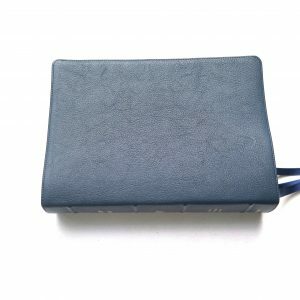 It is the perfect size for carrying around, hand-held instead of lapbound. 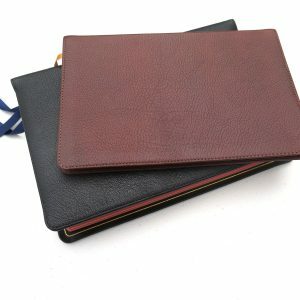 The Calfskin edition has a sewn yapp with a pasted internal liner (over card), it is not floppy like a Goatskin but it seems to be a plus for ease of use and durability of you plan to carry it around. Thank God for Schuyler publisher’s. 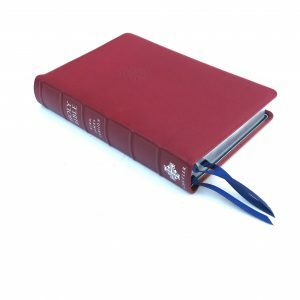 I appreciate that this bible is offered in a very soft calfskin cover that is less expensive but very high quality. 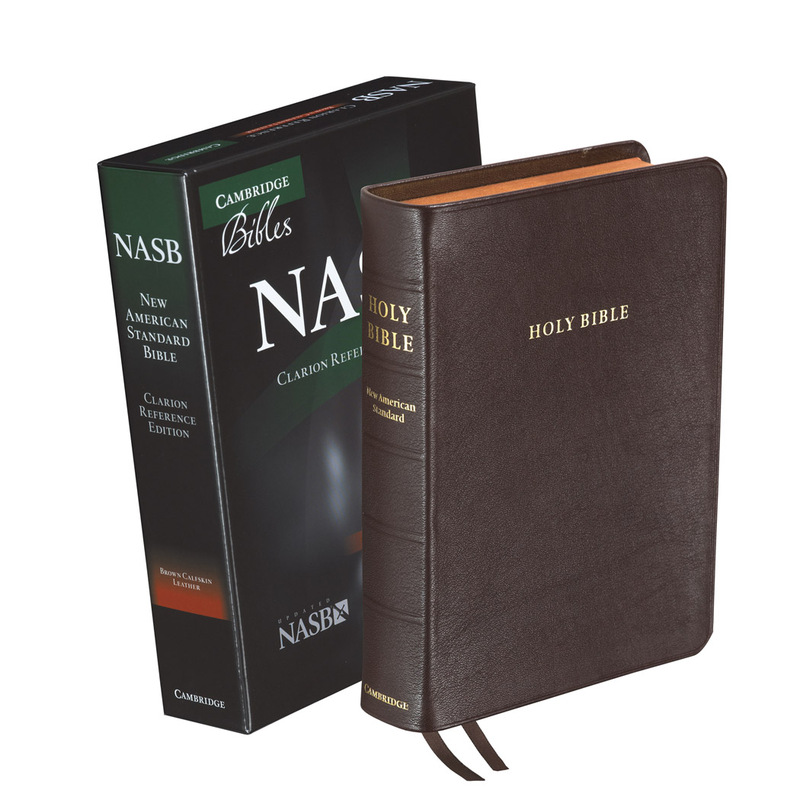 This is the most readable compact-ish NASB bible in the market. The font is almost identical to the font size in a regular sized Thompson Chain reference bible. The print is well done. The paper is kind of like the paper in the NIV Cambridge Clarion. This bible is really just perfect to carry and to actually read. This is my second NASB PQ because my wife “took” my first one! My first one was in black calfskin, so I decided to go with Brown this time. It’s compaeable to an brown baseball glove, and just beautiful! There’s nothing negative I could possibly say about Schuyler, nor this Bible. Just perfect in every way. 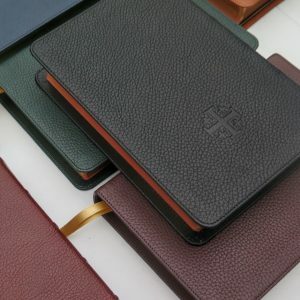 I would most certainly recommend the calfskin (haven’t seen the goatskin versions), the way it’s constructed guarantees it will last!!! I was fairly set on skipping this version of the Quentel. I already the Pitt Minion and had several nice Bibles, I didn’t see the need this time around. But, when my mother asked me for a Christmas list, I put this on out of curiosity (plus, I just started reading the NASB for seminary). I’ve been blown away with how perfect this little Bible is. It’s portable and readable. The calfskin is quite soft. The paste down binding makes the cover itself less flexible than a goatskin cover, but prefer that. Plus the calfskin doesn’t have the stiff hinge that many goatskin Bibles from Schuyler have. 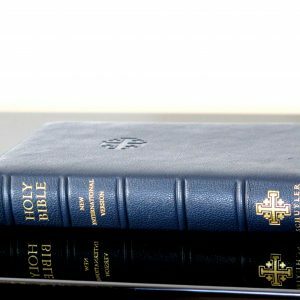 This allows the Bible to lay flat right out of the box. The paper is quality. The type is readable. I love the read type for chapter numbers. It’s a small thing, but I love what it adds to the look of things. Finally, the art gilding looks great. This Bible has ruined me. It will be very hard to fight the temptation to not buy every translation Schuyler gives the personal size treatment to! I was looking for a new portable NASB Bible to carry everyday to replace one from another publisher. That particular Bible had a good font size but the text just wasn’t dark enough for me. I found that I could only read it for short periods of time and had to put it down. 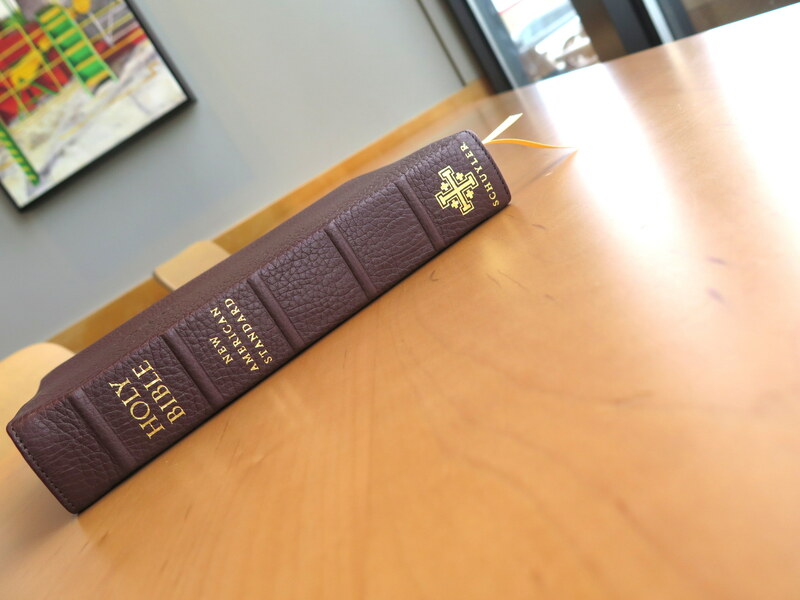 I have a full size NKJV QUENTEL so I decided to try the NASB PSQ. I’m so glad that I did. The text is dark enough and very clear. There is enough space between each line so that the words don’t look crammed on the page. It’s fantastic. I can read this Bible for long periods with no problems. I bought an imperfectly imprinted dark brown edition. I have to say that I was pleasantly surprised at how good my name looks imprinted over the first name. I’m glad that I took a chance. I’m very happy with this Bible. Beautiful bible, but a little thicker than what I’m looking for. I think I’ll try the Cambridge Pitt Minion. This was the 1st Schuyler Bible I had ever purchased. 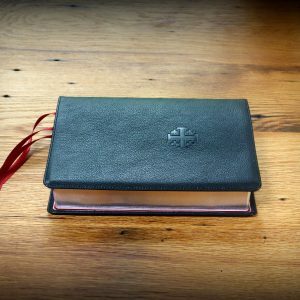 I have several “genuine leather” bonded leather” bibles which ultimately serve their purpose, but when I seen and felt the quality of Schyuler’s products I was hooked! 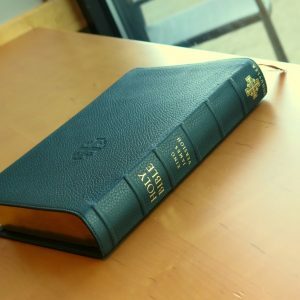 The calfskin on this bible has such a comfortable feel (yes some bibles are just uncomfortable in the hand) to it, it is simply hard to put down! I gave this to my wife and got a British Tan PSQ that is just simply beautiful, but in goatskin. I have to say there is a noticeable difference in the feel of the covers. The goatskin as opposed to the calfskin has a more “slippery” feel to it. 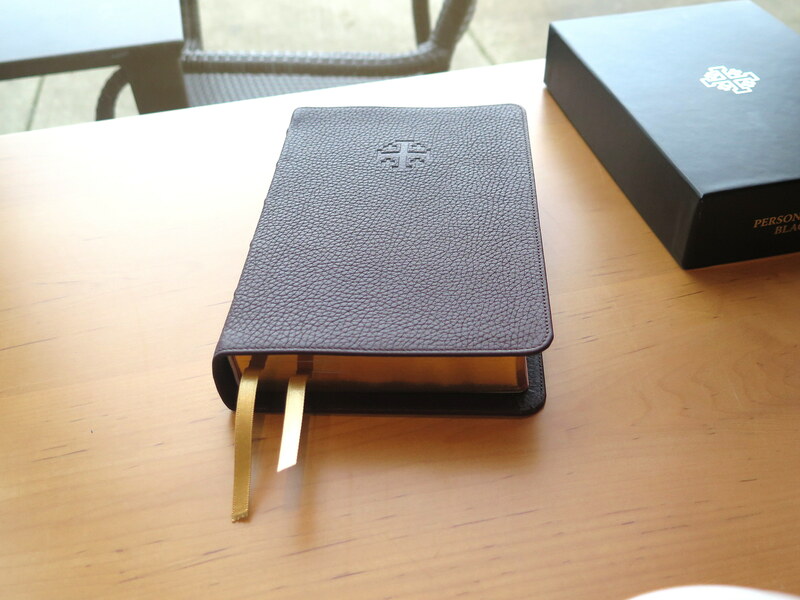 I don’t know if it’s just because I have dry hands, but the calfskin seems to have a “less slick” feel to it. I’m sure that as I continue to break it in that “slick” feel will diminish. 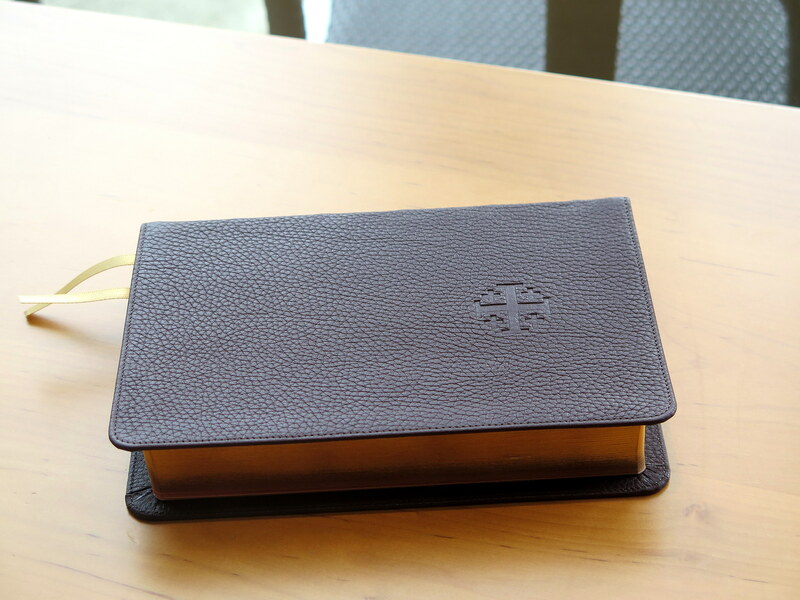 All in all the brown calfskin buttero is a fine bible that will keep my wife happy for years to come until it’s time to pass it on to a family member. I see excellent and quality workmanship.